Adorable sterling silver octopus studs, great quirky addition to your daily outfit! Hand crafted from Sterling Silver, the octopus's measure 0.8 mm by 0.8 mm. I only use genuine 925 sterling silver for all of my stud backs, and back clasps, so they are suitable for people who have sensitive skin. Each stud is hand cut from sterling silver sheet, sanded, and then soldered to a 10 mm long and 0.8 mm thick sterling silver ear post. They are polished and tumbled for a lovely shiny finish. 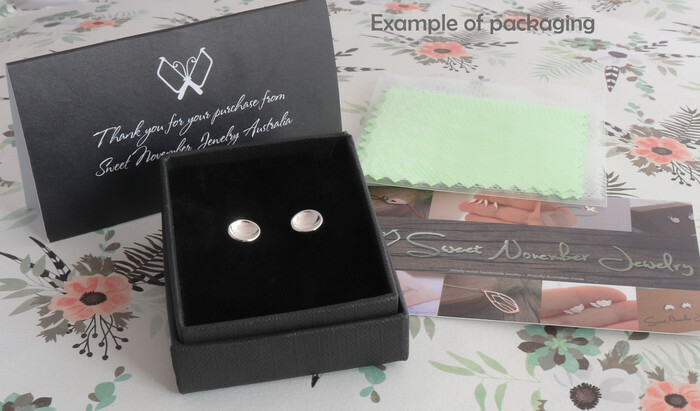 *All of my studs come safety packed in a small black gift box with flocked lining to protect them during posting, the sterling silver push backs are placed under the foam insert. You will also receive a free cleaning cloth with your purchase as a gift from me. All jewelry is ready for gift giving and as I don't include a receipt (unless requested) you can have your purchase sent directly to your recipient with a personalized note included. All of my jewelry is handmade, please allow for very small variances from piece to piece, as this is a feature of owning one of a kind original handmade jewelry.